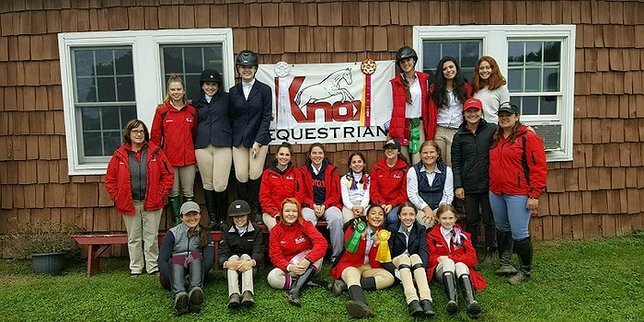 On Sunday, October 2nd, The Knox School hosted its Annual IEA (Interscholastic Equestrian Association) Horse Show at the Phebe T. Phillips Byrne Equestrian Center. Pictured: The Knox School Equestrian Team and their coaches Debbie Moore, Jen Christiansen, and Samantha Kaznocha. Photo by: The Knox School. St. James, NY - October 3, 2016 - On Sunday, October 2nd, The Knox School hosted its Annual IEA (Interscholastic Equestrian Association) Horse Show at the Phebe T. Phillips Byrne Equestrian Center. Six equestrian teams with sixty-five Middle School and High School riders from the local region competed in Jumping Class events, Flat Classes, and Hunt Seat Tests. The goal of this event is to allow riders the opportunity to earn enough points to carry them through to the regional competition in the winter. “The event was well attended and the riders were simply amazing! I am so proud of Knox and its riders for the effort, energy and enthusiasm they showed throughout the long day. Thank you to the students and faculty who came out to show support for their fellow students,” said Walter Towns, Knox Athletic Director. The Upper School team for Knox received several ribbons. Our seven upper school riders, Nikki Lombardi, Frances Clever, Tori Voelker, Annabel Shewan, Eliza Vostokova, Riley Hovsepian and Heather Feigenbaum amassed between them a first, 3 seconds, a fourth, 2 fourths, 3 fifths and 2 sixths. The Knox School’s Middle School team completed the event with a very strong victory, achieving the award of Reserve Champion within their division. Middle School riders Jessica Guginsky, a National rider from last season, placed first and second in her 2 classes, Grace Hayden, Abby Reavis, Andrea Infranco, Emily Lonegro and Megan Major won 3 thirds, a fourth, 3 fifths and 2 sixths. The event was well attended by students, faculty, and families of Knox and other team riders. The food at the event was great, and the Knox Equestrian Team had a very successful fundraiser with many raffle baskets auctioned off. Special thanks goes out to Debbie Moore and The Knox School Equestrian Program Staff for all their hard work in organizing this competition, Carol Cahile for coordinating parent volunteers, Knox families, and Knox Staff members for their support in making this event a huge success. The Knox School would also like to thank the Feigenbaum, Lonegro, and Major families for their generosity in supporting this event. About The Knox School: The Knox School is a 501c3 nonprofit institution that is built on a mission that provides the opportunity for capable students to excel within a liberal arts program infused with artistic and athletic pursuits, in preparation for higher education at selective colleges and universities. Our philosophy is to provide a diverse student body with a traditional, structured, and familial atmosphere that fosters academic, intellectual, and character development while celebrating individual strengths and talent. Rooted in the six core principles of integrity, kindness, courage, respect, responsibility, and scholarship, the Knox School aims to inspire in each student a love of learning and the desire to continually develop the skills necessary to lead happy, confident, and successful lives in a complex and changing world. Subject: LongIsland.com - Your Name sent you Article details of "Knox School Hosts Annual Interscholastic Equestrian Association Horse Show Competition"